High blood pressure, or hypertension, occurs when your blood pressure increases to unhealthy levels. 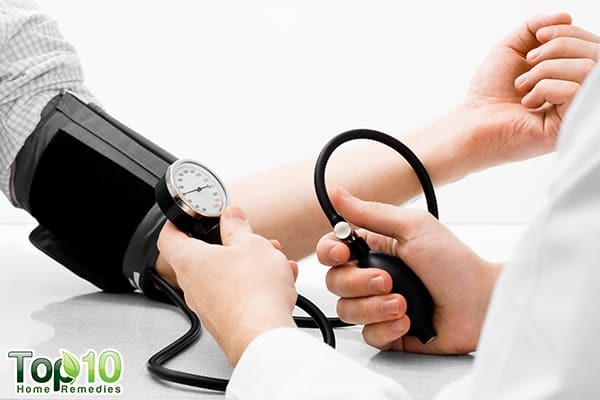 High blood pressure means that the force of the blood against your arterial walls is high enough that it may eventually cause health problems, such as heart disease. Hypertension is quite common. According to the Centers for Disease Control and Prevention, about 75 million American adults, or 1 in every 3 adults, have hypertension. Also, about 1 in 3 American adults has prehypertension—blood pressure that is higher than normal but not yet in the high blood pressure range (1). Hypertension is one of those health problems that can sneak up on you. You can have it for a long time without knowing it, as it does not cause symptoms right away. But even without symptoms, high blood pressure can damage your blood vessels and organs, especially the brain, heart, eyes and kidneys. This is why early detection is important. To gauge your risk for high blood pressure, it is important to understand the risk factors. Some risk factor are within your control and you can take steps to prevent this problem. 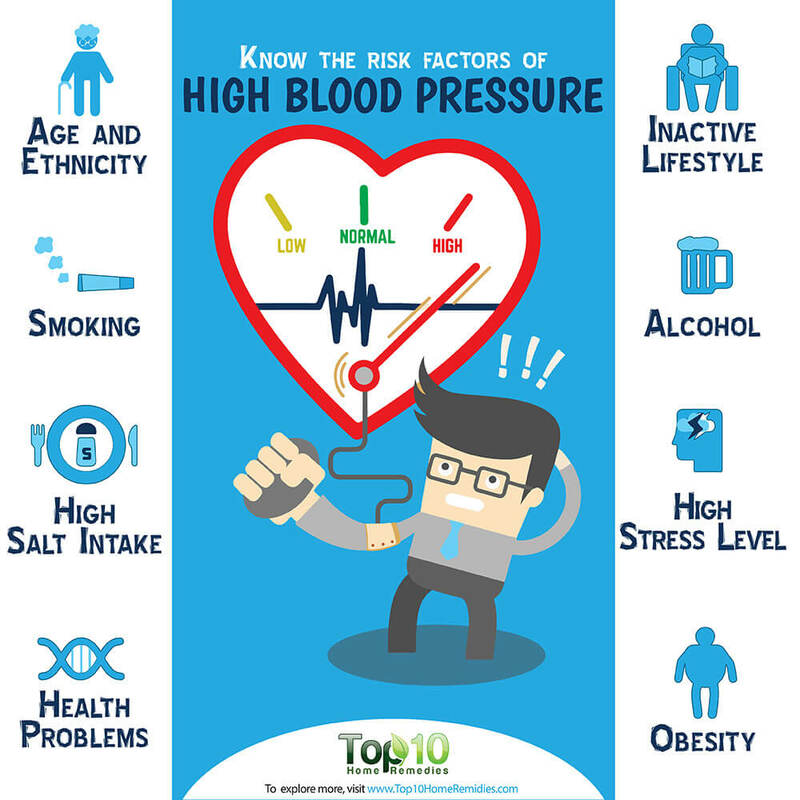 Here are the top 10 risk factors for high blood pressure. Your risk of hypertension increases as you get older. Men who are age 45 or above are at an increased risk of high blood pressure. Women are more likely to develop high blood pressure after age 65. High blood pressure is particularly common among black people, often developing at an earlier age than whites and people of other races and ethnicities. 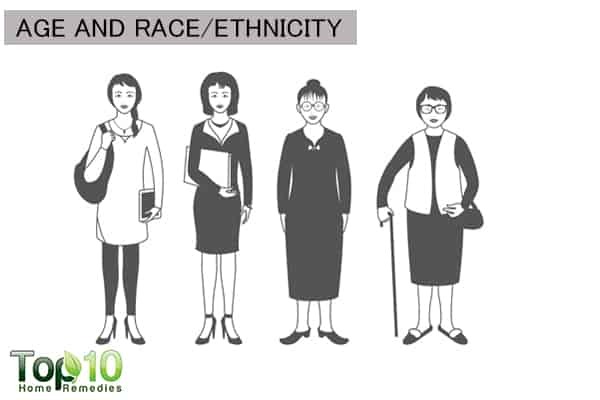 Serious complications, such as a stroke, heart attack and kidney failure, also are more common in blacks (2). The American Heart Association recommends all adults, beginning at age 20, have their blood pressure level checked every 4 to 6 years. As you age, ask your doctor how often to have it checked. Being overweight or obese is one of the common risk factors for high blood pressure. In fact, a body mass index (BMI) of 30 or above puts you at risk of high blood pressure. The more you weigh, the more blood flow is needed to supply oxygen and nutrients to your cells and tissues. As the volume of blood circulating through your blood vessels increases, the pressure inside your arteries rises. A 2014 study published in the Italian Journal of Pediatrics found that overweight, obesity and abdominal obesity were associated with prehypertension and hypertension in adolescents (3). Another study published in the BMJ Open Sport & Exercise medicine in 2017 analyzed the prevalence of obesity among student athletes and found that 50 percent of those with elevated blood pressure were either obese or overweight (4). 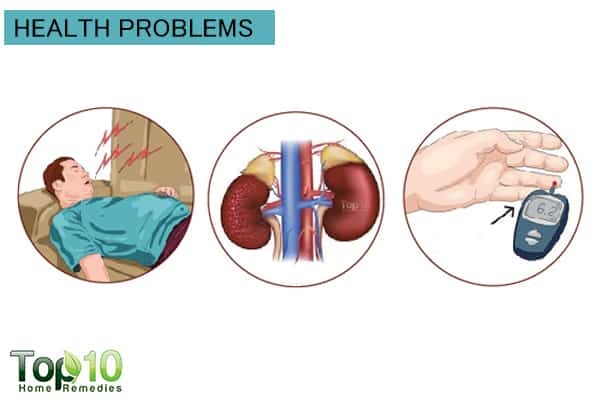 In addition, obesity can lead to heart disease, high cholesterol, diabetes, arthritis, chronic kidney disease, nonalcoholic fatty liver disease and many other conditions. You can reduce your risk of developing high blood pressure by maintaining a healthy weight and keeping your BMI between 18.5 and 24.9. Living a sedentary lifestyle and not getting enough exercise puts you at a higher risk for high blood pressure. Exercise increases blood flow through all the arteries in the body, which in turn leads to a release of natural hormones and cytokines. These hormones help relax blood vessels, which ultimately lowers blood pressure. Lack of physical activity also increases the risk of being overweight. 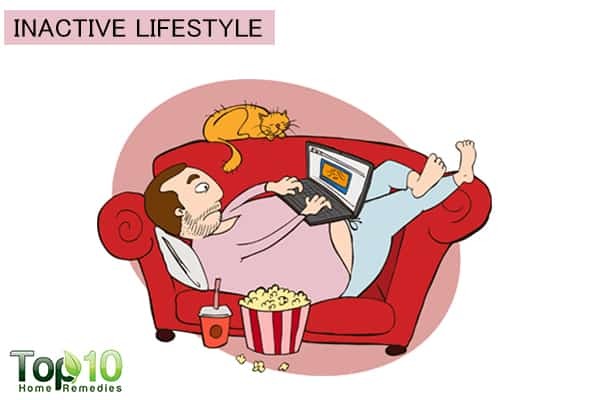 A 2010 study published in the International Journal of Nursing Terminologies and Classifications found that 60 percent of people who had high blood pressure had a sedentary lifestyle and associations with age and the presence of diabetes (5). A 2013 study published in Current Hypertension Reports recommends physical activity as an important lifestyle modification that may aid in the prevention of hypertension (6). You should aim to exercise for about 30 minutes most days of the week and increase your daily physical activity, such as short walks and other activities that keep your body moving. High levels of stress can lead to a temporary but dramatic increase in blood pressure. The hormones released by your body during stress strain the heart muscles. This in turn increases your heart rate and constricts your blood vessels, ultimately leading to high blood pressure. It also increases the risk of heart disease, chest pain or irregular heartbeats. A 1998 study published in the Wisconsin Medical Journal reports that although stress may not directly cause hypertension, it can lead to repeated blood pressure elevations, which eventually may lead to hypertension (7). A 2009 study found that blood pressure was more likely to increase in individuals who had stronger responses to stressor tasks than those with less strong responses. Although the magnitude of the effect was relatively small, results suggest the relevance of controlling psychological stress in the non-therapeutic management of high blood pressure (8). 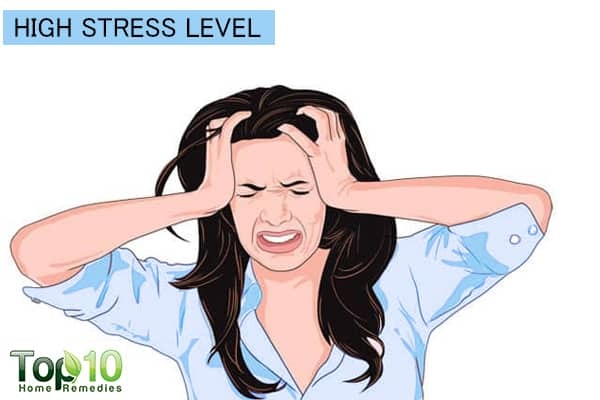 You can manage your stress and thus reduce its physical effects by practicing healthy coping techniques, such as muscle relaxation, deep breathing or meditation. Too much salt (sodium) in your diet is another common risk factor for high blood pressure. Excess sodium can cause your body to hold onto more fluid, and also causes your arteries to constrict. Both these factors can lead to an increase in blood pressure. 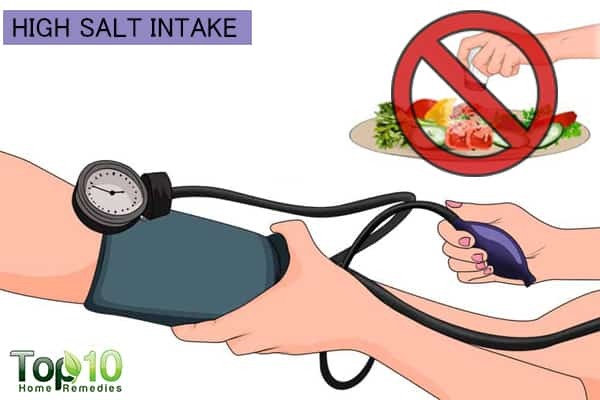 A study published in Electrolytes & Blood Pressure in 2014 concludes that a reduction of dietary salt intake can decrease the number of deaths from hypertension, cardiovascular disease and strokes (9). It is always best to limit your salt intake. The Dietary Guidelines for Americans set the recommended sodium intake at 2,300 milligrams (mg) per day (10). Too little potassium in your diet can also put you at a higher risk of developing high blood pressure in the near future. 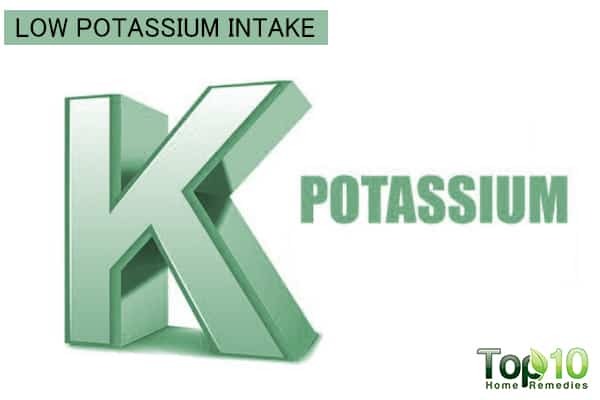 Potassium is an important mineral that helps balance the amount of sodium in your cells. This means low potassium intake will lead to an accumulation of too much sodium in your blood, which in turn leads to high blood pressure. Plus, potassium causes the smooth muscle cells in your arteries to relax, which lowers blood pressure. A 2015 study published in the Journal of Human Hypertension reports that increased potassium intake along with a low-sodium diet had a beneficial effect on blood pressure (11). A 2017 review published in the American Journal of Physiology addresses the possibility that diets higher in potassium is an important means of reducing the prevalence of cardiovascular and kidney disease (12). Drinking too much alcohol is another common risk factor. More than just two drinks per day can cause hypertension. This happens as alcohol intake activates the adrenergic nervous system, causing constriction of blood vessels and a simultaneous increase in blood flow and heart rate. A study published in Clinical and Experimental Pharmacology & Physiology in 2006 reports that regular consumption of alcohol elevates blood pressure, with global estimates that the attributable risk for hypertensive disease from alcohol is 16 percent. 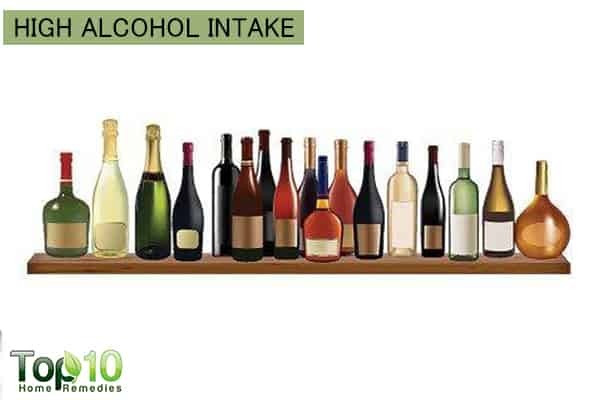 The study also says that the increase in blood pressure is approximately 1 mmHg for each 10 grams of alcohol consumed and is largely reversible within two to four weeks of abstinence or a substantial reduction in alcohol intake (13). A 2014 study published in the World Journal of Cardiology establishes the association between high alcohol consumption and hypertension. However, the mechanism through which alcohol raises blood pressure remains elusive. The study also says that reducing the amount of alcohol intake can prevent alcohol-induced hypertension (14). If you drink, it’s best to limit yourself. For healthy women, that means one drink a day. For healthy men, it’s two drinks a day until age 65, then just one. The harmful toxins and chemicals in cigarette smoke damage the walls of your blood vessels. This increases the risk for the buildup of fatty substances (plaque) inside the arteries (atherosclerosis), a process that high blood pressure is known to accelerate. Both active and secondhand cigarette smoke is bad for your heart health and your blood pressure. A 2006 study found that mean daytime systolic and diastolic blood pressure readings were consistently higher in smokers compared to nonsmokers regardless of antihypertension medication use. Nocturnal dipping was similar for smokers and nonsmokers (15). Smoking is not good for your heart and overall health. 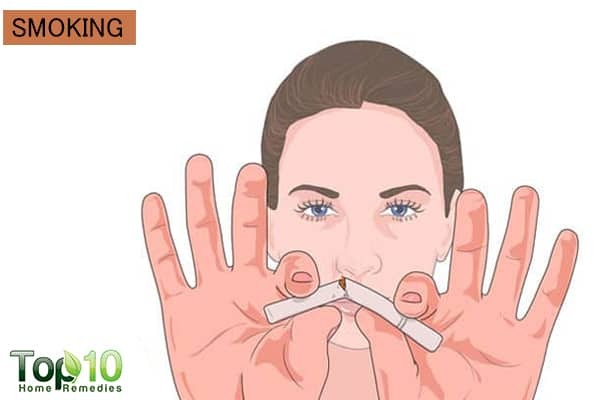 You must try to quit smoking as soon as possible. A diet low in vitamin D can also make you prone to high blood pressure. Vitamin D suppresses the enzymatic process that can constrict the arteries and lead to high blood pressure. Also, the sunshine vitamin improves blood circulation throughout the body, which is essential for your heart to function properly. A 2017 study published in Cureus analyzed several studies and found that many studies have shown an indirect relation between 25-hydroxyvitamin D serum level and blood pressure. 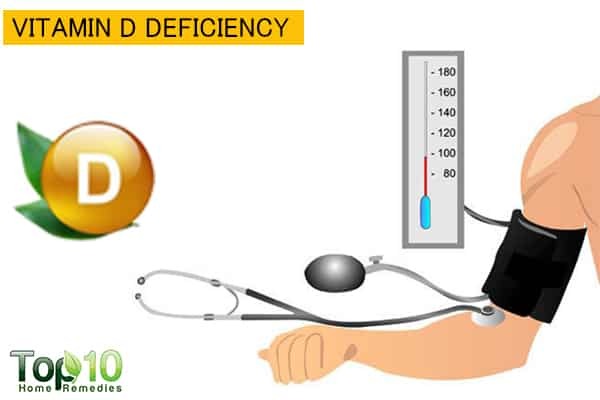 However, the study suggests that more studies, especially randomized trials, should be conducted to establish the connection between vitamin D and hypertension (16). Certain chronic conditions also may increase your risk of high blood pressure. Such conditions include diabetes, kidney disease and sleep apnea. Sometimes, pregnancy contributes to high blood pressure as well. A 2003 study published in the American Journal of Epidemiology shows that women who have gestational diabetes are more likely to have high blood pressure. However, women who manage their blood sugar levels during pregnancy are less likely to experience high blood pressure (17). Take your blood pressure medications prescribed by your doctor prescribes on time. Do not stop the medications or change the dose without consulting your doctor. Monitor your blood pressure at home regularly. Try the Dietary Approaches to Stop Hypertension (DASH) diet, which emphasizes fruits, vegetables, whole grains, poultry, and low-fat dairy foods. Have foods high in potassium and magnesium in your diet. Maintain a healthy weight or lose weight if you’re overweight or obese. Limit sugar and refined carbohydrates to help you lose weight and lower your blood pressure. Say no to excess drinking and stop smoking totally. Regular physical activity can help lower your blood pressure. Practice relaxation or slow, deep breathing to lower your blood pressure. Make sure to get good, restful sleep of 7 to 9 hours daily. Consider cutting back on caffeine, as it raises your blood pressure temporarily. Division for Heart Disease and Stroke Prevention. Centers for Disease Control and Prevention. https://www.cdc.gov/dhdsp/data_statistics/fact_sheets/fs_bloodpressure.htm. Published June 16, 2016. High Blood Pressure. Centers for Disease Control and Prevention. https://www.cdc.gov/bloodpressure/family_history.htm. Published April 05, 2018. Association between obesity and high blood pressure among Lithuanian adolescents: a cross-sectional study. Italian Journal of Pediatrics. https://www.ncbi.nlm.nih.gov/pmc/articles/PMC4265335/. Published 2014. Obesity and elevated blood pressure in suburban student athletes. BMJ Open Sport & Exercise Medicine. http://bmjopensem.bmj.com/content/3/1/e000276. Published November 01, 2017. Prevalence of sedentary lifestyle in individuals with high blood pressure. International Journal of Nursing Terminologies and Classifications. https://www.ncbi.nlm.nih.gov/pubmed/20500611. Physical Activity and the Prevention of Hypertension. Current Hypertension Reports. https://www.ncbi.nlm.nih.gov/pmc/articles/PMC3901083/. Published December 2013. Stress and hypertension. WMJ. https://www.ncbi.nlm.nih.gov/pubmed/9894438. Published December 1998. Effect of psychological stress on blood pressure increase: a meta-analysis of cohort studies. Revista Brasileira de Hematologia e Hemoterapia. http://www.scielo.br/scielo.php?script=sci_arttext&pid=S0102-311X2009000400002. Dietary Salt Intake and Hypertension. Electrolytes and Blood Pressure. https://www.ncbi.nlm.nih.gov/pmc/articles/PMC4105387/. Published June 2014. Executive Summary. Chapter 4 – 2008 Physical Activity Guidelines. https://health.gov/dietaryguidelines/2015/guidelines/executive-summary/. Effects of sodium and potassium supplementation on blood pressure and arterial stiffness: a fully controlled dietary intervention study. Nature News. https://www.nature.com/articles/jhh20153. Published February 12, 2015. Cardiovascular benefits associated with higher dietary K+ vs. lower dietary Na+: evidence from population and mechanistic studies. American Journal of Physiology-Endocrinology and Metabolism. https://www.physiology.org/doi/abs/10.1152/ajpendo.00453.2016. Alcohol is bad for blood pressure. Clinical and Experimental Pharmacology and Physiology. https://www.ncbi.nlm.nih.gov/pubmed/16922819. Published September 2006. Alcohol-induced hypertension: Mechanism and prevention. World Journal of Cardiology. https://www.ncbi.nlm.nih.gov/pmc/articles/PMC4038773/. Published May 26, 2014. Twenty-four hour blood pressure record for smokers and nonsmokers. Revista Brasileira de Hematologia e Hemoterapia. http://www.scielo.br/scielo.php?pid=S0066-782X2006001700016&script=sci_arttext&tlng=en. Does Vitamin D Deficiency Lead to Hypertension? Cureus. https://www.ncbi.nlm.nih.gov/pmc/articles/PMC5356990/. Published February 17, 2017. Association between gestational diabetes and pregnancy-induced hypertension. American Journal of Epidemiology. https://www.ncbi.nlm.nih.gov/pubmed/14652299. Published December 15, 2003.